I recently saw a recipe which could be described as ‘Italian Dilis’. Take a couple of sage leaves and sandwich an anchovy in between. Batter and then deep fry. Never tried, but it looked interesting. Also noticed your link to fennel. Next time your in the bay area, look on the sides of 101 from SFO. You’ll notice that it grows wild. Albeit, that the highway version is probably loaded with exhaust and break dust. It does grow wild though and is harvested in urban areas by people in the know. 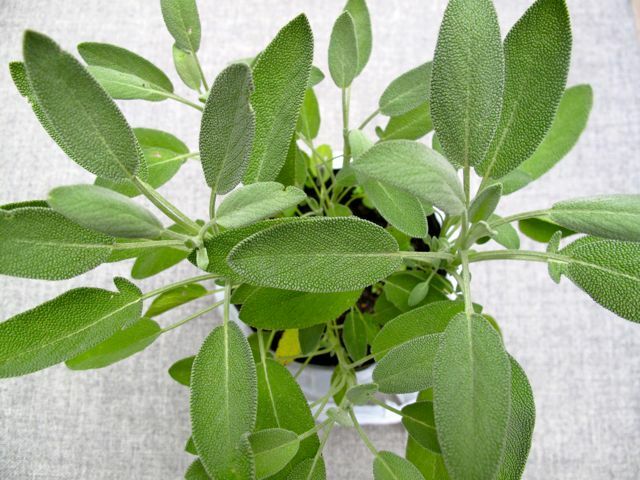 Known as sambong (or salvia in Spanish), sage is a widely dispersed herb in the Philippines but as you said, its flavor might not exactly fit your expectations or the requirements of your recipe. Most plants are sensitive to terroir, you see and the ones that grow in the tropics tend to turn out more potent since it has to vie with a lot of other plants for the pollinators’ attention or to repel more tenacious predators. That’s probably why old folks use it as remedy for headaches. In Noli Me Tangere, when Crisostomo Ibarra came home from his European studies, she showed Maria Clara the dried sambong she gave him years before, wrapped in tissue, which he kept with him in his wallet as a treasured keepsake from her. Btw, it is the predominant flavour of turkey stuffing here. Thanks for this post, much appreciated. @Footloose, many thanks for the Noli Me Tangere reference, I missed that completely. I didn’t know until now that sage and sambong are one and the same. Here in the US Midwest, we also use sage, along with thyme and parsley, for Thanksgiving turkey stuffing. sambong is a medicinal plant that is used for urinary tract infection. Just like the food supplement Sambongcur. I should re-read Noli Me Tangere. I love sage in soups also! I read in a Martha Stewart Living article that herbs, particularly basil, should not be allowed to flower and that buds should be nipped as soon as they appear. Otherwise, the herbs would taste bitter. Maybe locally grown basil taste like overgrown grass sometimes because they were not nipped properly. This is of course just pure speculation. Hi MM, its not that you have a black thumb, sage is a very hard plant to grow in our climate. We have had difficulty growing these plants over the years, and I have basically given up on growing Sage on a commercial basis. I may start again once our new water treatment machine comes on line. Betchay…if the herbs were started indoors or any plant for that matter and were not HARDENED OFF to climatize the plant before being sold, normal reaction of the plant would be to go into shock when sold straight from the greenhouse and planted outside. Best thing to do once you bring it home and before you tranplant into the ground or pots, leave it out a few hours each day for about a week. However, no need to do this if the plants were direct seeded outside. It could also be that you are killing it with kindness by overwatering it. Poke your finger into the soil. If it is dry, time to water! You don’t need to water it everyday. I agree with the “overgrown grass” comment, especially with basil. Sometimes I find fresh locally grown basil a little overwhelming. And here I am, living in Masambong (somewhere in Quezon City) for 30 years, only to find out now that sambong is sage! Older folks said that the area where our barangay stands used to be full of sambong plants, hence Ma-Sambong. Haven’t seen any now though. hi MM, how about roast chicken rubbed with onion and sage (in butter or olive oil) on the skin and under the skin, or roast chicken with onion and sage stuffing? Sage is a terrific herb. I use it as aromatic for pasta and meat dishes. It is also easy to grow here; I had my sage bush for five years now and when it flowers, the bees are attracted to them along with my oregano and lemon balm…I drink sage tea a lot; good for colds and flu and lore says it has a substance known to improve memory. I wasn’t so keen on herbs before, but now, they are one of the joys of summer and I love singing SimonGarfunkel’s Scarborough Fair to them. Been staring at my little container herb and vegetable garden on my deck I started several weeks ago and they are doing nothing. I am afraid the herbs will be defoliated from my picking before any new leaves grow. The weather has been my enemy, waxing between cloudy, cool days and heavy rains. Even my lone tomato plant is so spindly…. and the container soil is always wet it seems. Now I know the problem. I have to disagree with footloose and say that sambong (at least the one that grows in the phils.) and sage are two different plants. Sambong that I remember has smoother leaves as opposed to sage’s distinct leathery texture. I was able to grow sage from a packet of seed(yates) bought at SM makati once before. It grew to about a little bigger that what MM has in the pictures above. I was able to make use of some leaves before black aphid-like bugs devoured and killed all of them. I’ll try again soon maybe with a screened-off soil bed. Here in northern Europe, all the way to the UK and Ireland, sage is traditionally teamed with pork. I always poke a few chopped leaves into cuts in a roast (say several ribs of a loin) with some garlic. Herbs are seasonal here too and sage is one of those which freezes well. Just put some leaves in an ice cube tray, cover with water and freeze. You can keep it in the trays or store in freezer bags. Then just thaw a cube or two as needed and dry the leaves with paper towels before using. Not quite as good as fresh, but maybe for the powerful tropical variety this may be an improvement! Same goes for here, too! The weather is not cooperating and won’t cooperate for another month it seems according to the almanac. This is generaaly what i do in the winter…plan ahead by relying on the Almanac what kind of weather we will be having for that year. Knowing we will have a wet spring than normal, I wait and wait ….before starting my seeds indoors. If tomatoes were started really early, then you will no doubt have spindly ones by the time they are transpnated in the ground. Here’s a tip, carefully dig out your tomatoe plant and plant them deeply in the ground. If it is too tall for your container, plant it sideways,,,,rootball is lying on the soil sideway and cover with soilup to the just below the top second set of leaves poking through. It will grow to be more sturdy for roots will come out from the stems lying across. Make sure to snip the leaves from the stem that is going to be buried. Can you picture it? Siopao…best thing to do is cover your plants you want to protect rom any pests while growing with a lightweight row cover . That is what I do with my carrots. The cover stays even when they are ready for harvest…even the onions too are covered. Crop rotation is a good habit to get into as well. Wit the amount of vegetables and herbs I plant, I do not have time sometimes to spray EACH plant with my organic concoction depending on the problem. Anothe rthing you might want to try is companion planting. Go on the web and look for what plants repel pests. Usually marigolds is a sure winner depending on the plant you want to protect. Oh…pasingit again, MM! Ms. Connie C. …it is a bad year as I have said for strawberries. I should have been picking by now but there are no strawberries to pick. Howver, I have been canning last year’s salmon to make way for the chinook season which is just around the corner. I have only 2 jars left of the Portuguese style canned salmon like the Tome sardines. When the frsh chinook comes, might you be interested in canned spring salmon with oilive oil and pickles and carrots, bay leaves….or with olive oil, chorizo, basil , garlic, roasted peppers, shallots? I have to smile when I see the reference to “sage” as what that brings to my mind is “what kind of sage”?! I grow six different kinds of culinary sage alone, not to mention the ornamental sages (plus numerous varieties of other herbs–varying numbers of basils, thymes, members of the allium family, lavenders…). A classic flavouring for me is fresh whole Berggarten sage leaves fried in butter to accompany pasta in the Northern Italian style. And I love pineapple sage with grilled fish. The medicinal properties are well known, hence the genus name Salvia (from the Latin for “to save”). Having said that, some sages are not edible, so one should do some research before cooking with them. Connie C–many herbs do not like their “feet” wet–they need a drying out period in between watering. Most culinary sages are fairly resistant to dry periods, some more than others (pineapple sage being perhaps the least tolerant, but even it does not like wet feet). Oh bettyQ, thanks for the tomato planting tip. I’ll try it in my large container where I have the spindly plant. I know exactly what you mean as that is similar to bamboo planting (horizontally ) for propagating it. Ground hog in the garden does not allow me to plant on ground. And yes! to any biyaya you will shower upon me as in the Portuguese style canned salmon ; the second one with the chorizo sounds good but salt is not a friend to hubby, so will have to forgo that one even if my salivary glands are near overdrive lusting for your canned salmon. Kurzhaar, agree on the water sensitivity of herbs, but nature is not being kind this time of the year and keeps my container garden wet, GRRRR! Maybe the herbs need an umbrella…… Imelda style, but only for the rains. Connie C, be sure to follow Betty Q and Kurzhaar’s sage advice from now on and do not use the soggy weather as excuse. I grew sage indoors all year round when I was living in Hong Kong. It needed very little care and flourished despite my benign neglect. @betty q: thanks for the tips! will try it soon. I remember Gordon Ramsay saying that he had a low sperm count because of his profession. (because of all that heat from the stove at about the level of his… you-know-whats) He attributes an increase in his sperm count by eating sage and was able to conceive their first child after that. 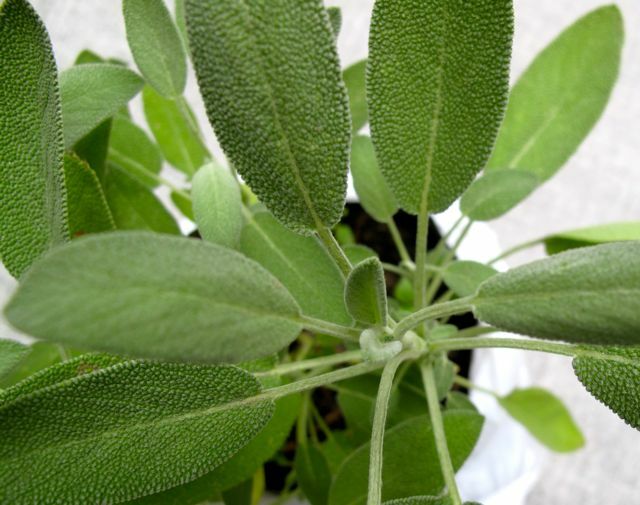 If you can find sage, large leaves, dip them in a flour/water batter and fry them in EVOO. Accompanied by a glass of white wine before going to the table for dinner, this unusal delicasy is relatively unknown even in Italy which is where the idea comes from. May I venture a correction please? Sambong is Blumea balsimifera (here is a link:http://www.philippineherbalmedicine.org/sambong.htm. Folklorick medicinal use of sambong is as an anti-urolithiasis and a diuretic. It is also used to treat kidney disorders. Its leaves an also be used to treat colds and mild hypertension. Sambong is definitely a hardy shrub which grows profusely in the Philippines. Sage is Salvia oficinalis, there may be two kinds of sage, one is culinary -used more for cooking and the other is psychoactive. As a medicinal sage is used to treat mouth sores, mouth ulcers, and sore throat and as a psychoactive drug, researches are now centered on the possibility of the herb to protect a key chemical destroyed in the brain by Alzheimer’s disease. Although the two shrubs look similar, they are not the same. ‘K,’K, Madam Footloose. Will heed the sage advice… or advice from the sages? @Siopao and Dodi, Sage (Salvia Officinalis) is native to the Mediterranean but has many cousins worldwide. Blumea Balsamifera (Linn) is Philippine sage, known locally as sambong. @Connie C, Monsieur to you. Footloose: This is meant to be a compliment, but you have shown so much of your feminine side, including a bit of haughtiness if I might add, and so my address to you. @Connie C, no apologies required. I think the next eye-ball huddle is just about due. MM – Sage, like thyme and rosemary and most of the culinary herbs, needs a lot of sun, but is very sensitive to prolonged moisture. In the Philippines they grow well during the first half of the year, but when the rains come, they usually rot easily . If you want your sage plant to grow some more, I suggest you prepare this simple potting mix – half garden soil and half sand, or, if you have access to carbonized rice hull (ipang inuling) one third each of the garden soil, sand and carbonized rice hull. Many like to put a lot of compost, but I’d rather avoid compost – it absorbs more water that’s not good for sage. Put some of the mix to the bottom of a larger pot. Transfer the plant – WITH ROOTS INTACT – , then fill the remaining spaces with your potting mix. The potting mix should provide better drainage for the plant. And the larger pot will encourage your sage to grow some more. You might even want to cover the spaces with some thyme or marjoram. When the rains start coming more frequently, just transfer the pot to a portion of your home that receives a lot of sun but is protected from the rain. If that portion is covered by a transparent roofing material, then that’s even better. Oh another thing, too frequent picking of leaves will lead to smaller leaves – a “Bonsai” effect . Crushed Sage+Thymian mixed with marinade for Spareribs or chicken for grilling gives a unique flavor! hi ask ko LNG San po kaya pwede magbuy ng sage tea here in olongapo city.. Thanks..
Sir? Can you tell me where can i find a Sage Herbs or Tea? Help! Anyone know Legazpi City??? Help Again? Next stop, Boracay? !